SGS Engineering have a great range of sanders for sale that are suitable for many surfaces and applications. Get the finish you’re looking for with one of our impressive domestic sanders from Ryobi and Hyundai. How do cordless sanders work? The new generation of cordless sanders, powered by lithium-ion batteries, allow you to sand large surfaces without the need for a power supply, making them much easier to use. Palm sanders are designed to sit in the palm of your hand, allowing them to be used horizontally and in smaller spaces where a larger sander may not fit, so they’re ideal for light DIY sanding work in the home. A random orbit sander, oscillates and rotates and can be used as a polisher on larger areas, such as floors. A cordless belt sander is ideal for heavy duty work. Powerful and fast, they can remove up to 700g of material per hour and collect debris in a dust bag, keeping your workspace clean. Should you require any further assistance or information regarding which sander would be right for you, you can use our Power Sander Buying Guide for reference. Whether you’re looking to buy belt sanders, random orbit sanders, palm sanders, cordless sanders or detail sanders, we have the sander for you. We stock a variety of different types of sanders to make sure you get the job done right first time including a corded sander or planer from Hyundai, which offers a high-power output. Our Hyundai sanders include features such as a variable speed dial and dust collection, which make them convenient tools to use. So whether you’re sanding a table to prepare it for paint or polishing floors, you’re sure to find the right sander for you. Each of our sanders are available with free next day delivery option. Products can be returned within 60 days and individual warranty information is available on each product listing. 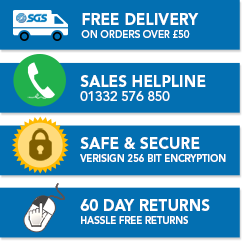 For any further queries, our sales staff are available via email on sales@sgs-engineering.com and on the phone 01332 576 850. We can advice you which power tools will be useful in your household. Find out which battery is right for the power tool and task in hand.